With the spring semester of 2016 underway, Albion is seeing a lot of new changes: a high number of transfers, a new layer of frost on campus, but most importantly, a new floor in the Dow fieldhouse was installed over this past winter break. The fieldhouse was built in the late 1980’s and was made possible by a gift from the Herbert H. and Grace A. Dow Foundation. It’s named the Lomas Fieldhouse after Dr. Bernard T. Lomas, former president of Albion College from 1970-1983. The flooring in the fieldhouse was about 25 years old and was in need of an update..
Keifer Flooring partnered with Mondo Flooring to make the installation. Mondo Flooring has provided the technical and logistical support to 10 consecutive Olympic Games and has had 250 world records broken on their products. According to Jerry White, vice president for finance and administration at Albion College, the new floor cost a total of $370,000. White also said that the cost per square foot amounted to $11. The fieldhouse is used for a number of different activities. It features three basketball courts, an indoor track that is one-ninth of a mile, a batting cage and two racquetball courts. The fieldhouse can be used by all students and Dow facility members and it is the host of the spring sports that cannot get outside because of the weather. Along with varsity sports, intramural sports take place in the fieldhouse which include dodgeball, flag football, floor hockey, indoor soccer and walleyball. The intramural season starts in September and goes until late November. 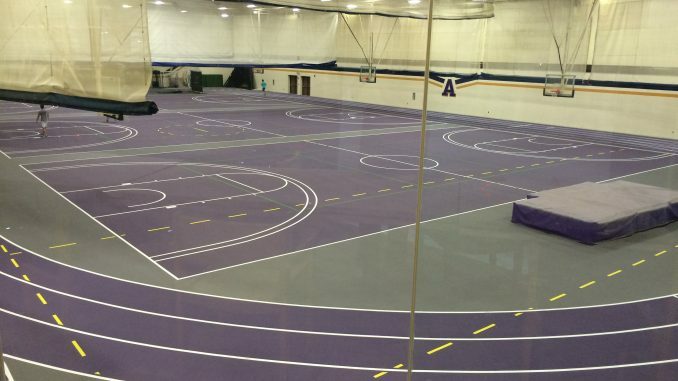 The new floor is primarily purple and gray, and freshly painted white lines surround the track and basketball courts. It’s noticeably stickier than the old floor which will be a valuable asset to all students. The track is also spike resistant, so track athletes will be able to wear spikes without damaging the track. “I think the floor installation is more about providing a benefit and addressing a need our current students had versus focusing on an improvement that would help recruiting,” Arend said. The new flooring was the only update that was applied to the Dow facilities. Arend said that they are now focused on the project that will bring new baseball, softball, soccer and lacrosse fields in the fall.